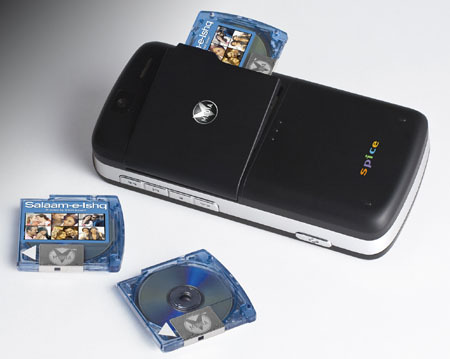 Optical media manufacturer Vmedia Research has launched a UMD-esque miniature disc that’s designed to allow everyone to watch films from a single source, whether its on their mobile phone or their home entertainment system. The single layer optical discs, which are encased in a plastic shell, measure 32mm in diameter. Each one holds up to 1GB of content and displays it at a resolution of 576p, which Vmedia said is possible through a combination of “blue laser technology”, H.264 video compression and AAC audio codec. Vmedia’s already partnered with handset manufacturer Spice Corp to develop a specially crafted handset capable of accepting the miniature discs. Although relatively little’s been said about the handset so far, it’s known that the discs slot into a drive developed in partnership with Panasonic and Vmedia. 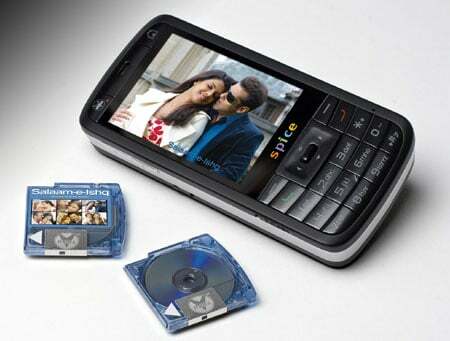 Each disc, which will sell for about the same price as a DVD, will also be compatible with home entertainment systems. However, Register Hardware is sceptical about the media's ability to compete against the established DVD, Blu-ray and HD DVD camps. Nonetheless, Vmedia maintains that its optical discs are as simple to operate as inserting one into a disc bay and pressing play. First generation drives are already shipping to handset manufacturers, with a second-generation 9.5mm diameter disc expected later this year. Dual-layers discs with a 2GB capacity are then expected to appear in 2009. Pricing information isn’t available yet. Format's fans must buy new players? So why buy HD DVD discs then?